McCall, Idaho - With the threat of wildfire danger increasing rapidly throughout central Idaho, local land management agencies will implement Stage 1 Fire Restrictions in the Payette Dispatch Area beginning at 00:01 a.m. on Friday, August 11, 2017 and will remain in effect until October 1, 2017 unless rescinded earlier by the jurisdictional agencies. These restrictions are being implemented by agencies managing state, private and public lands in the area, including the Bureau of Land Management (BLM), United States Forest Service (USFS), Southern Idaho Timber Protective Association (SITPA), and the Idaho Department of Lands (IDL). Fire restrictions are intended to decrease the risk of any human caused wildfires in the designated areas. Stage 1 Fire Restrictions will be in effect within the Payette Fire Restriction Area. 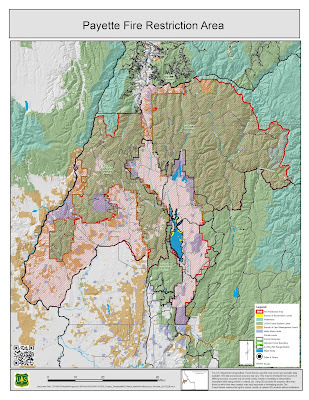 This area includes the Payette National Forest (excluding the Frank Church-River of No Return Wilderness), Idaho State Lands, Boise and Cottonwood BLM Field Offices and private lands in central Idaho. 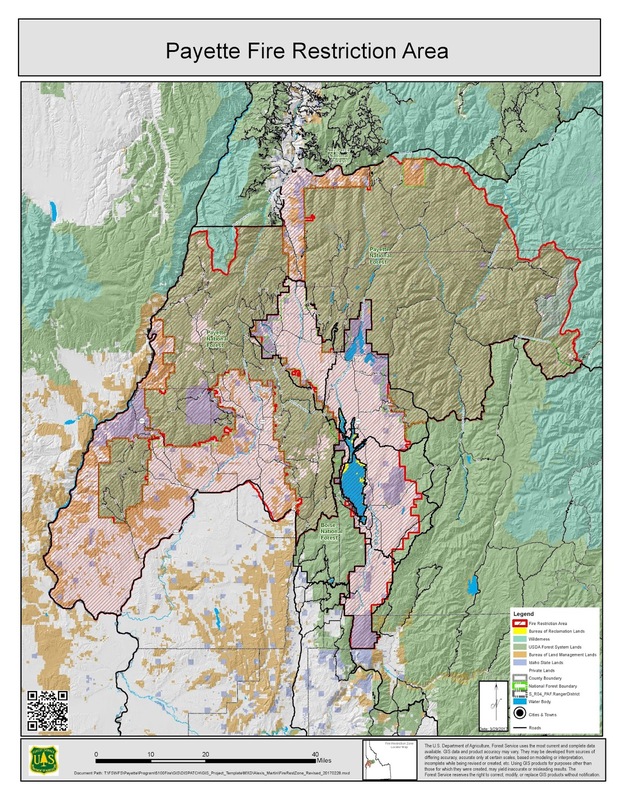 For a detailed map of the Payette Fire Restriction Area see below and visit: http://www.idahofireinfo.com/p/payette-mountains-fire-restrictions.html. Fire, fuels and weather conditions as they relate to fire restrictions will continue to be monitored – based on these conditions, restrictions can be rescinded or additional restrictions issued if conditions warrant. The land management agencies would like to thank the public for their attention to fires in Idaho so far this season and ask for their help in preventing any future unwanted fire with drying fuels and hotter temperatures expected to continue into this fall. · Building, maintaining, attending or using a fire, campfire or stove fire except within a designated recreation site, or on their own land, and only within a permanent land owner-provided structure. (See liquid petroleum fueled stove exemption below). · Smoking, outside an enclosed vehicle or building, or designated recreation site, or while stopped in an area at least three feet in diameter that is barren or cleared of all flammable materials. · Persons with a written special use authorization specifically exempting them from the effect of this order. · Persons using a stove or grill that is fueled solely by liquid petroleum fuels. Such devices, including propane campfires, may be used only in an area cleared of flammable material. · Persons using a stove fire (a fire built inside a fully enclosed metal stove, grill, or sheep herder type stove that is outfitted with a chimney that is at least five (5) feet in length that is equipped with a spark arrester consisting of a mesh screen with screen opening of 1/4 inch or less). · Persons using metal fire pans (sides must be 3 inches high with a metal grate on top) within ¼ mile of the Main Salmon River. Pack-out of ashes is required. · All land within a city boundary is exempt. With the volume of wildfires burning throughout central Idaho, fire managers are asking the public to be extra cautious when spending time in the outdoors. Idahoans are also reminded that the use of fireworks are prohibited on forest and range lands in Idaho during closed fire season (May 10 through October 20). Please visit http://www.idahofireinfo.com/p/fire-restrictions.html for current information regarding fire restrictions or contact the local land management office.